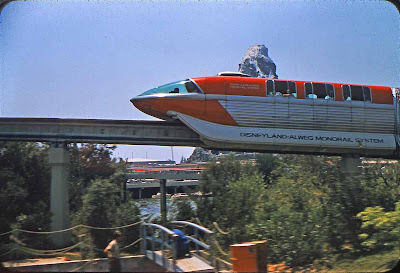 I think that in Disneyland it is just a novelty, but in Disney World the monorail is the main mode of transportation to Magic Kingdom and Epcot from the parking lots, as well as the Magic Kingdom hotels. 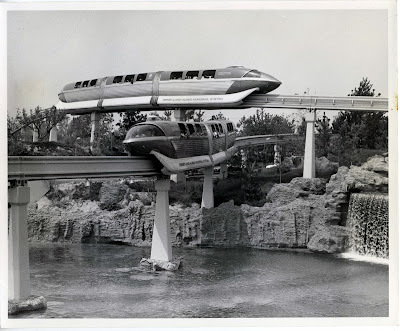 Audio downloads, vintage photos and side-by-side script comparisons between the onboard spiel of the Disneyland-Alweg Monorails of 1976 and 2001 are available at Sorcerer's Workshop.org. The ride was originally sponsored by Southern Pacific Railroad and was promoted as the passenger rail system of the future. Getting people to imagine traveling in something other than a car in Southern California is no small feat! I'm not sure that the monorail even runs between the Disneyland Hotel and teh park anymore. With the new parking structure (!) and the tram cars, that old beast was turning whiter.